Masonry International is the main publication of the International Masonry Society and is normally published three times each year. It has a Journal section containing original papers on research and practice. It also contains news items, notices of meetings, book reviews and issues concerning legislation and International Standards. 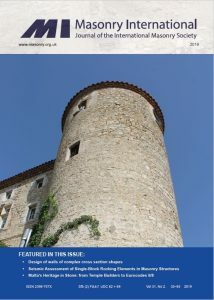 Members can download for free any journal article from the back catalogue and whole issues of Masonry International from Volume 29, No 1 onwards. Non-members can purchase the downloads. See our Publications Section, which also includes hard copies of Masonry International and other IMS documents for sale to members and non-members. The next issue is being formulated and journal articles are being accepted. If you have an item to be considered for publication then let us know via the contacts page. Articles are normally received in Microsoft Office Word format.